Three generations of Polish Americans have been working together just north of Custer, SD, to blast and chip a mountainside into a monument to the spirit of the American Indian. 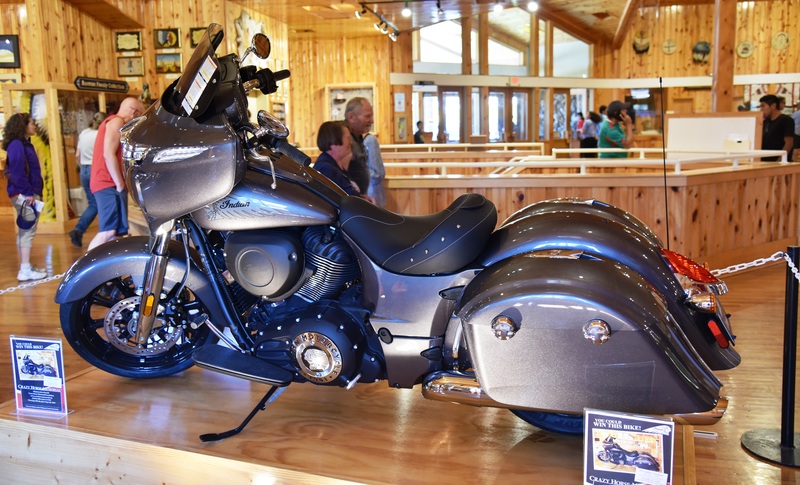 They have turned this project into a lucrative family business, which incidentally is the American Way, if not the Native American way. In 1939 Chief Henry Standing Bear approached Korczak Ziolkowski, who had served one summer’s apprenticeship to Gutzlon Borglum of Mount Rushmore fame, about building a larger mountain carving as a tribute to the spirit of Native Americans (Chief Henry used the term “Indian”, so henceforth will I.) Korczak sold his wife Ruth on the idea, a deal was struck with the Sioux, and together they set out planning and building this huge monument on a barren hillside purchased from the Federal government via trade of 900 acres of prime farmland from Chief Henry. 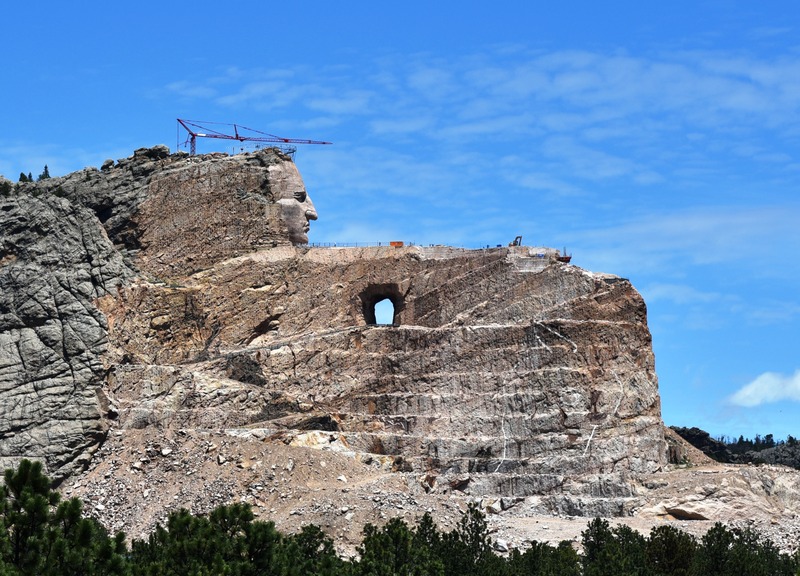 Construction began around 1948 and 70 years later the facial features of Crazy Horse have been finished. He had flowing locks – his Indian name as a boy was Curly – and when finished he will be depicted on horseback with the face, chest and foreleg of the horse also chiseled out of the rock. Mount Rushmore took 14 years to complete using pre-World War II equipment and technology, but it is perhaps a third of the dimensions of Crazy Horse, in three directions. Later Sioux tribesmen and women, notably descendants of the namesake chief, looking at the $30,000,000 or so in annual ticket sales and other park revenue, complained that a tribute to a tribal hero has become a path to riches for the white sculptors while construction drags on and on. Others have objected to Chief Henry cutting this deal on his own – the People are supposed to be involved in such major plans for uses of our tribal hunting and burial lands. The Monument on the Day of Our Visit … 200 Years to Go? 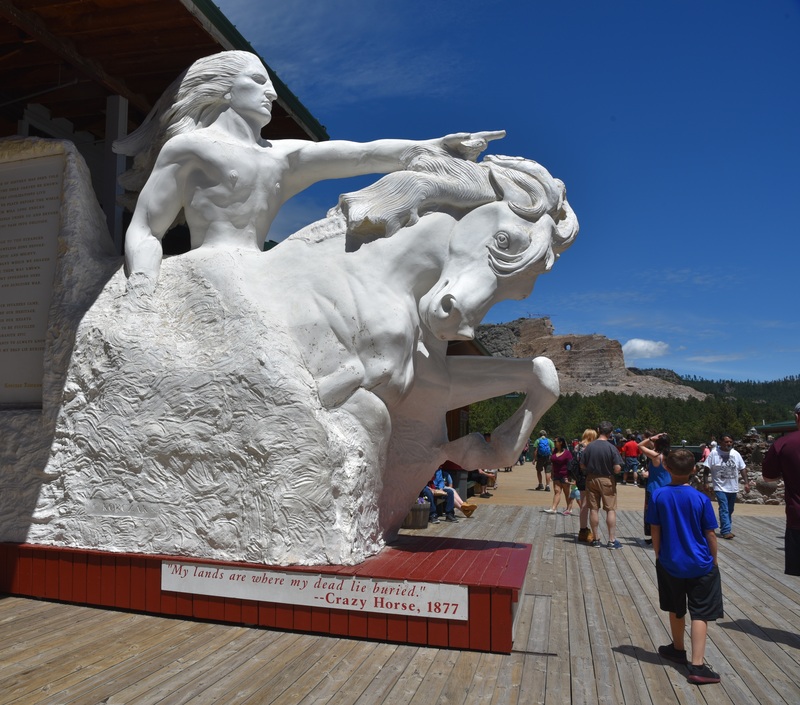 If all goes well, perhaps in another 150 to 250 years Crazy Horse will be complete. Things may not go well. The structure could collapse, the family could splinter, fuel could be so expensive no one drives here — who knows? 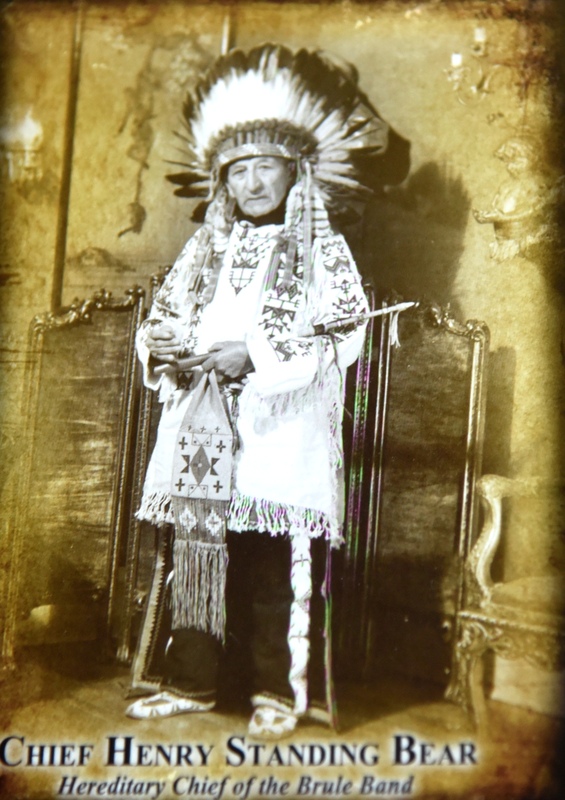 I am not Sioux, Cherokee, Seneca, or Caddo, but I am on fairly good terms with the Great Spirit. I enjoy Indian art from both before and after we made them stop wearing feathers and speaking their own languages. 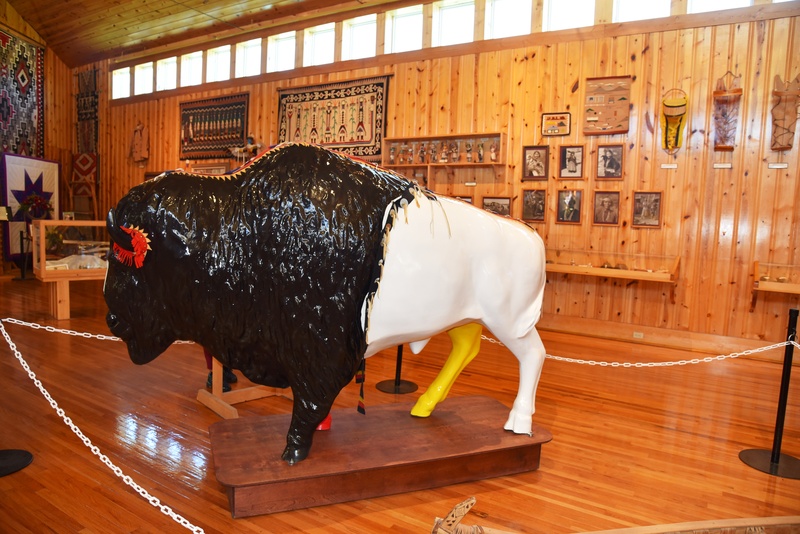 It seems to me that this monument/museum project is a force for good, even if it is one that has to be expressed in the white man’s language with a narrative and images we can understand. Long before the monument is complete our fellow Americans of Indian descent will realize that the future eventually beats the past. Had the British squashed that rebellion in 1775 in time the Brits would have killed off the buffalo and spread smallpox and cholera to the People. Had the French kicked out the English 20 years earlier, the outcome would still be the same. The days of the noble savage were numbered: hunter-gatherers need a lot of space, and by now, that space would have been taken and dominated by people with access to books, guns, and agriculture. Nonetheless this is an impressive monument and perhaps a better museum. Someday Kat and I must see the Smithsonian’s Museum of the American Indian. So should you. 3 Raffle Tickets for $25. Drawing To Be Held in November.